The bulk of the frame is a pair of direct-drive bicycles placed two-feet apart. Triangular parts maintain structural integrity and an overarching roof structure provides support for the windmill generator and to resist bending from the rigors of pedaling. All four wheels are 24-inches in diameter and the rear wheels caster to allow the front wheels to provide steering as well as propulsion. 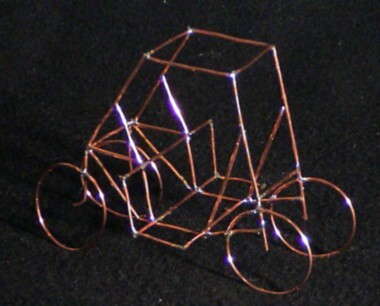 The frame has been modeled in 1:15 scale using copper wire. The material and scale were chosen because they were convenient. Although balsa wood and glue would also have worked, 14-gauge copper wire and solder were more readily available. The scale was chosen by printing the CAD drawings on an 8 1/2" by 11" page and then cutting the wire according to the lines on the page.